This handbook provides a clear and detailed analysis and summary all of the amendments to the Illinois Marriage and Dissolution of Marriage Act taking effect on January 1, 2016. 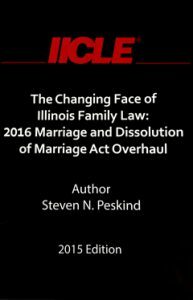 This essential handbook reveals the much changed face of family law in Illinois. Each section begins by citing the new law with all strikeouts and additions as referenced in PA 99-90 and then includes discussion on the changes. This handbook also discusses and references many of the important cases that helped shape the law and the six years of work of the study committee formed in 2009 to provide a “new and improved” IMDMA. When appropriate, Practice Pointers related to the changes are also included to provide guidance for procedures, schedules, and responsibilities that you will need to incorporate into your case management protocol.